This is a Tamiya model replica of the British Achilles tank destroyer. The Achilles was a modification of the M10s which Britain received from the U.S., with the original 3-inch main gun replaced by the fearsome British 17 pounder. The vast majority of M10s were the M10 IIC variant, which was based upon the late-production M10 with distinctive enlarged turret-rear counterweight. Around 1,000 were produced between Spring 1944 and the end of WWII, the Allied forces making good use of it after the Normandy landings, benefiting from the power of the gun which allowed it to tear through Tiger I front armor. - 1/35 scale plastic model assembly kit. - Features newly-molded parts depicting the upper hull with its sloped armor, late production M10 turret counterweight, and long 17pdr gun. - Interior features depictions of shell racks and multi-part 17pdr gun breech. - Comes with 3 full body figures – gunner and loader seated in the fighting compartment, and commander seated on the turret edge – plus a driver torso figure. 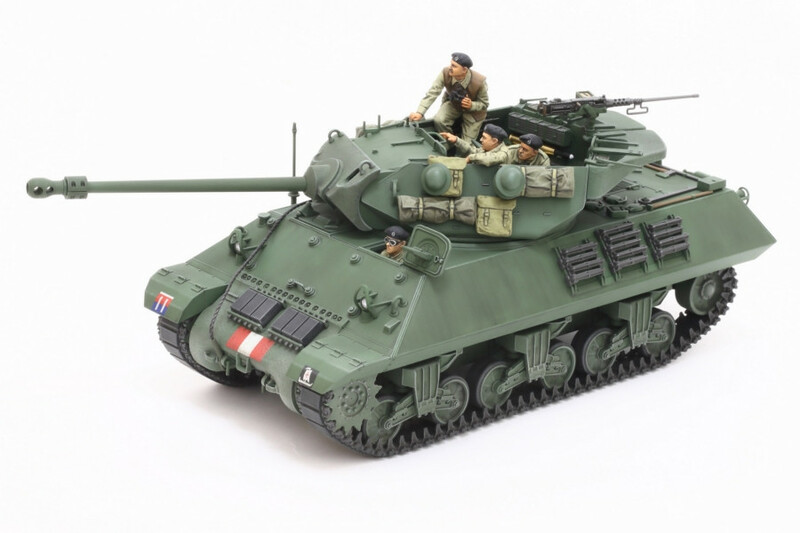 - Lower hull, suspension, wheel and track parts are carried over from the acclaimed Tamiya 1/35 model of the M10 that served as the Achilles’ base. - New sprocket wheel parts depict late M10 components. - Marking options depict 93rd Anti-Tank Regiment (Italy, 1944) and 75th Anti-Tank Regiment (NW Europe) vehicles.